Arrow Video is really making us Giallo fans happy! These somewhat forgotten Italian films from the 70's featuring a mysterious killer (usually disguised in some manner), lots of nekkid women and enough blood to fill a swimming pool really deserve another chance. And luckily we have Arrow to come to the rescue. 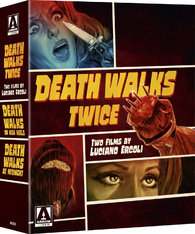 I had seen both of the films in this collection - Death Walks on High Heels and Death Walks at Midnight - several years ago and they both stuck out as shining examples of the genre. The director Luciano Ercoli is a favorite of mine, directing the brilliant giallo Forbidden Photos of a Lady Above Suspicion and the Polizioteschi Killer Cop (aka La polizia ha le mani legati). Death Walks on High Heels (1971) stars Italian screen great Frank Wolff (Once Upon a Time in the West, The Great Silence) as a doctor who is obsessed with a stripper named Nicole (Susan Scott aka Nieves Navarro - Ercoli's wife). After being attacked by a masked man, Nicole accepts the doctor's proposal to run away to England. Her boyfriend (Simon Andreu) isn't pleased and tries to find her, while the masked man does too. Death Walks at Midnight (1972) also stars Susan Scott as Valentina, a model who witnesses a murder while under a hallucinogenic drug given to her in a clinical study. Though initially laughed at, it soon turns out that a murder recently happened the same way as what she had seen and she finds herself being chased by the same man who she saw in her hallucination. She must save herself while trying to figure out who is trying to kill her and why.